Start with a discount offer on your product or services. Do this before you identify what the product is or have established any value in that product. Got it? Ok, now add some exclamation points. Lots of them!!!!! Also make sure your send an email that prevents your prospects from replying back to engage with you. “Do Not Reply” is too popular to talk with your prospects. If you really want to alienate your prospects, use cheesy graphics and a convoluted layout. You can also commit the cardinal sin of marketing and omit a “call to action” (CTA). Include some links that don’t work and you have a terrible marketing email. Writing a terrible marketing email that not only fails, but annoys your prospects not your goal? 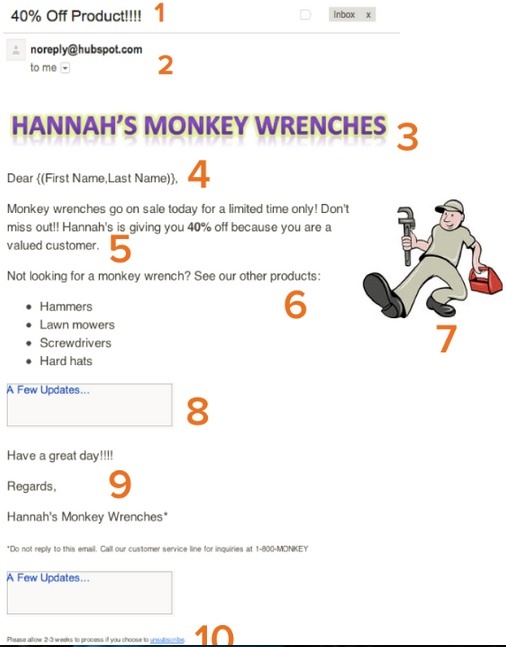 Then I recommend reading HubSpot writer Hannah Fleishman’s “Anatomy of An Awful Marketing Email”. She draws a very clear picture of what to avoid in order to succeed with your email marketing campaign. Sometimes, knowing what not to do is even more valuable than knowing what to do.